There are three Kings in the world: Budweiser, Richard Petty, and Elvis. The latter was known for his affection of Cadillacs (and guns − sometimes paired together). Nineteen seventy-seven may not have been the high-water mark for Cadillac, but a nice surprise to the brand during that time was the Seville. Elvis thought so too, making this the last car he bought before his death. The Seville was Cadillac’s new “compact” luxury sedan, marketed as more of a premium European-style package despite the fact that it was a Chevrolet Nova underneath. The tactic worked quite well, unlike the later Cimarron. By that time, the Seville had evolved into what was basically a FWD 4-door Eldorado with a retro Brit bustleback. 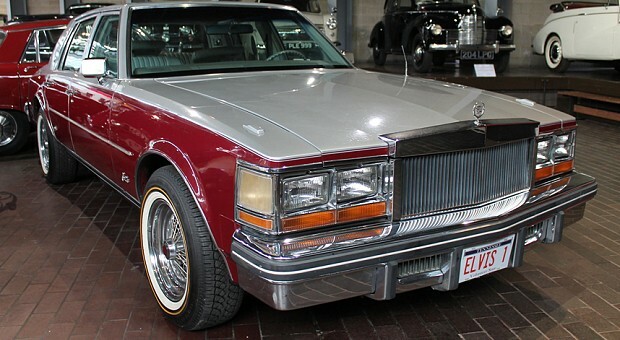 Painted in the classy combination of silver and burgundy, Elvis’ 1977 Cadillac Seville also features a CB radio. That was quite the rage back in the day, although The Telegraph says it was to communicate with his guardhouse and kitchen at Graceland. After The King’s death, the 1977 Cadillac Seville was willed to his father, who gifted it to Elvis’ girlfriend. A number of years later, it hit the auction circuit, eventually ending up in the United Kingdom. Current owners Steve and Susannah Hall have lent it to the National Motor Museum in Beaulieu. This isn’t the first Elvis-owned Cadillac to come across our jaded eyes, either, as his 1967 Cadillac Coupe De Ville also found itself for sale. And his 1955 Cadillac Fleetwood. And his El Dorado. Why do you insist on referring to the ’76 thru ’79 Sevilles as being a Chevrolet underneath. It demonstrates that you have no understanding of the specialised work that went into developing the Seville and that its commonality with the Nova is tiny. This Nova story is often used on the internet, a source of unbelievable inaccuracies. The finished Seville at $14,000 was often road tested against a $36,000 Rolls Royce Silver shadow II. In many respects the Seville is a much more effective car. Do you have any long time driving experience of either? Show me the road tests between a Chevrolet Nova and a Rolls Royce. None. Do the Seville and Nova share the same chassis? I’ve heard different stories on that. Not that it would make a difference. Rolls Royce paid Citroen a license for years to use their hydraulics, doesn’t make the RR a Citroen. RR used Cadillac/GM transmissions, climate control and refrigeration parts for years. Doesn’t make a RR a Cadillac. The development work to refine the Seville was leading edge in those days. The way a Seville drives and rides is in many respects better than a Rolls Royce. Have you driven these cars at length?